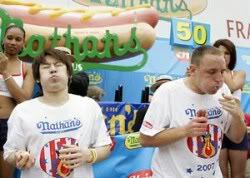 Yep, six-time world titler Takeru Kobayashi relinquished his “crown” July 4 at the Nathan’s Famous Hot Dog Eating Competition to American Joey Chestnut . In other words, that’s a 66-hot-dog-in-12-minutes win over 63. Chestnut is so far only the second non-Japanese to have won the title. More from here. And the good news is, it’s in English. Haha hindi lang hotdog ano?